Since joining WestEd in 2007, Stephen Ruffini has focused on charter school monitoring, reviews of programs for students with disabilities, after-school programs, and project-based learning. All of these studies have concentrated on or involved implementation analysis. Ruffini coordinates the monitoring of charter management organization federal grant implementation and is collaborating on school district reviews of services for students with disabilities. He is also directing an implementation analysis of a state teacher evaluation framework and collaborating on a study of project-based learning. Ruffini’s completed projects include a number of other district reviews of services to students with disabilities, analysis of restructured school time, and a national survey of high school federal funds. In addition, Ruffini has designed and conducted surveys, interviews, and focus groups as well as coded and analyzed data. His quantitative areas of expertise include random and stratified sampling, data management, and statistical analysis. Prior to joining WestEd, Ruffini directed research and program evaluation at the GED Testing Service to improve the information value of the tests. 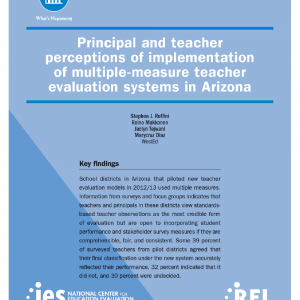 Previously, he conducted numerous research and evaluation projects in a large urban school district. He spent six of those years collaborating with district and school leaders to improve data availability and use that contributed to monitoring progress on a federal consent decree. Ruffini received an MS in educational psychology and a PhD in educational administration from Penn State University, both degrees emphasizing applied social research methods. His areas of interest include implementation analysis, charter management organizations, and special education.